In the concluding part of his rallying call for shipping to use technology more wisely, Dr Martin Stopford from Clarkson Research identifies ways ahead. Yesterday I wrote about the first 5,000 years of shipping and how the business model had not changed too much (access article here). 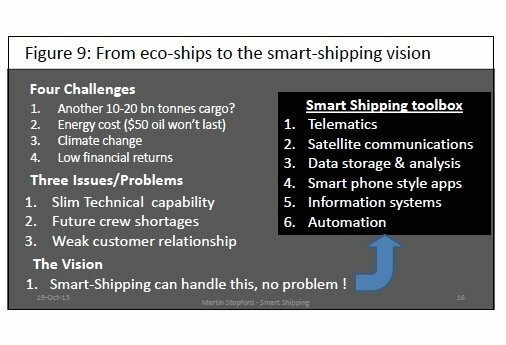 The article, which featured the first two of my five Smart-Shipping propositions, also looked at how efficiency and savings made from technology had been squeezed as hard as possible in the past couple of decades. Today, we look at how shipping can catch up with its automotive and aviation counterparts. In the 21st century another wave of change is creeping up on the industry. I’m going to call it Smart-Shipping and it is different from previous waves. Its focus is on improving every aspect of sea transport by using systems made possible by recent advances in Information Technology and Communications (ICT). The focus of smart shipping is not on the design of the ships, it is in the way we use them. The rapidly maturing ICT systems will make it possible to manage a cargo transport performed by a fleet of ships with the ruthless efficiency which BMW manages the production of motor cars. The revolution at the heart of this system is the fact that after 5,000 years in which the ship has been a “stand-alone” business unit, suddenly satellite communications, telemetrics and cheap data storage are making it possible to treat a fleet of ships as a single business unit, managing the fleet and optimizing cargo transport as a single business unit. This will affect every aspect of the business from personnel, maintenance, logistics, safety to overall cargo productivity (which for the first time management can monitor on a real time basis). A major element in this new business model is the use of telematics to monitor every aspect of the shipping operation and process data into a form which allows management to make timely and informed decisions. Improved productivity and quality control transform the reliability of the business, and of course the product. This technology is already used in other transport sectors. But the current neo-classical business model means the maritime industry is not well placed to respond to a revolution which is essentially management intensive. One could be forgiven for assuming that the maritime industry would be one of the most advanced users of information and communications technology. Navigation, ‘logistics, efficiency – these are all crucial to the sector, and very much the domain of ICT… But step aboard the average ocean-going vessel and you’re likely to see computing equipment that many landlubbers would consider decidedly behind the curve. This is, perhaps a consequence of the way the business model has developed and it leaves shipowners in a very difficult position, with little technical depth and customers unwilling to pay for change. So we should not assume it will be easy. This section explores the nature of this 4th wave of change; what is driving it; and what it might achieve. In the process the industry will need to change the way shipping companies are run; and address some of the difficult issues of efficiency, safety and personnel management which shipping companies face today. The real focus of smart-shipping is fleet transport management. The focus here is on optimizing the overall management of the business by treating the transport performance of ships as a single production unit, like a BMW car plant. The result is QA systems that really work, not a set of manuals nobody consults. The next step is to take a look at the technology which is available today – the “Smart-Shipping toolbox”. Much of this technology is not new. For example telematics had been around for decades. But today they are cheaper, easier to program, more reliable and we have communications systems which can use their output more effectively. It’s a philosophy Steve Jobs recognized with his mantra “design is how it works”. 1. Telematics (IOT): programmable “sensor” chips are now cheaper, better and can transmit their output to a central company database. They can generate digital information about ship equipment and performance without human intervention. This means systems and stand-alone apps can monitor just about anything. Feedback loops enable automation (and generate reports). Improved maintenance systems and should have a very significant impact on quality assurance. This is already happening in other transport segments. Lots of these are already on board ship, waiting to be used. 2. Satellite Communications Technology (ICT): global communication with ships is about to take a big step forward. Inmarsat launched its 3rd Ka band geostationary satellite on 28 August 2015, completing the Global Express network. They say that when the system is live in 2016 they will offer 99.9% reliability with access through a gateway system developed by Cisco. That will give customers control over costs and the ability to vary bandwidth in response to changing operational requirements. Competing systems are under development. Data and voice communications can be close to real time anywhere at sea, allowing the fleet of ships to become single production unit. 3. Big Data & the Cloud: the cloud allows companies to store large quantities of data generated by telematics, without the need for shipping companies to develop their own in-house server systems. This information generated by the ship and the fleet as a whole, of which there will be a great deal (the ubiquitous “Big Data”), can be inexpensively stored for management and research purposes (for example condition based monitoring to improve maintenance systems and reduce breakdowns, study operating procedures, cargo handling etc). 4. Smart phone style apps: provide the example and the capability to develop “apps” which do specific jobs efficiently, without big computer systems. Lots of them are about already, but for good results across the fleet and the industry they need to be developed within a disciplined framework, as Apple does, to ensure compatibility in operation. IPhone technology is years ahead of the curve, providing a model, an example and an inspiration. 5. Automation & robots: sensors with feed-back loops allow automation of many functions. Not new but getting easier, cheaper and much more accessible to companies who just want to do simple jobs better. Navigation is an obvious area and the progress made with cars provides a good example. This does not need to be immediate progression to driverless ships, a very difficult topic which should only be considered when the industry has much more experience and depth. Devices like autonomous cruise control and engine management systems (the engine stops at traffic lights) used on cars are a better illustration of the way this technology can be applied. So that is what is in the toolbox today. Like all tools, they are only as good as the craftsmen that use them. But armed with this technology shipping company management should in theory be able to transform the business from a fleet of stand-alone ships (the 5,000 year old business model) to a transport factory with shared management, operations, systems and management team. Well, that’s the vision and of course there are many issues to be resolved. Information technology does not always live up to expectations immediately. One of the most difficult issues in this whole discussion is “why should the industry change?” The last really big revolution of this type was containerization in the 1960s. The history of that period shows that the existing liner companies found the change from running fleets of small multideck liners to a smaller number of container ships doing the same work difficult, and for many of them, impossible. The capital investment was enormous and the human consequences often traumatic. In the end the real driving force was that handling cargo with old-fashioned multideck liners became impossibly expensive. Today’s business model does not have any such tangible obstacle to overcome but today’s shipping business model faces equally serious shortcomings in terms of regulatory standards, personnel and QA. These need to be addressed, and Smart-Shipping is based on well proven management techniques. 1. Customers are getting connected. Amazon is built around warehousing and regional delivery. The move to direct global systems may not be so far away and when it happens shipping companies must be a key part of the network. 2. Regulations require performance improvement in new designs (EEDI) and existing fleet (SEEMP). Shipping companies are no longer anonymous and detailed knowledge of what they are doing will increase. That means greater pressure for real time measurement resource use, especially people, ships, fossil fuels and door to door emission performance. The MRV pressure can only increase. 3. Customers are pressing for tighter control of door to door transport, in containers, specialized and potentially in bulk too. The present system only addresses this in a superficial way. 4. The need to radically reduce accident rates, for commercial as well as health and safety reasons. 5. The need for a business model which allows employees in a shipping company to be effective as a single team, with better and more rewarding career opportunities for young people and greater integration between ship and shore. These are just a few thoughts, but the pressure on companies with little management depth to cope with all of this could turn out to be challenging and ICT offers a solution which can be applied at various levels. For centuries each ship has been a profit center, financed and operated as a production unit trading within a small or a large fleet. Today the average shipping company controls only 5 ships. 85% of the world’s shipping companies have less than ten ships. This is perfectly logical because the level of overheads for bulk and containership operations is relatively slim, so big companies benefit from few significant economies of scale. 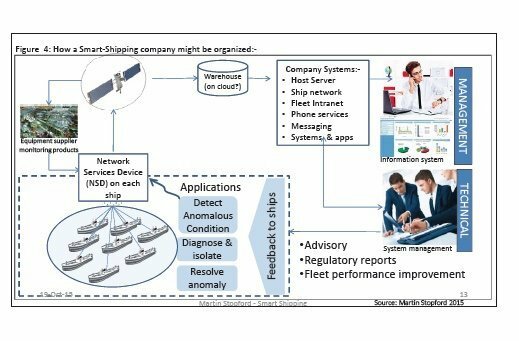 However, to be effective Smart-Shipping technology needs this model to change, allowing the industry to move from managing transport on a ship by ship basis to a fleet based system built around an “intranet of ships” which binds the whole business unit together. Each ship in the fleet has a Network Service Device (NSD), effectively a server, which collects information from sensors on the ship; processes it into a standard digital format; and runs on board applications. The ship would be equipped with sensors in the engine room; cargo handling equipment; the bridge; and on any performance sensitive equipment. The main tasks of the applications would be to monitor, detect anomalous conditions, diagnose the cause, and take whatever action is programmed into the system to resolve the anomaly. This might just be better reporting and alarms, or it could involve automated responses. In addition the NST transmits all the data collected via a satellite to equipment manufacturers monitoring their own equipment (e.g. engines) and the company data warehouse which filters and stores data, forwarding time sensitive information to the company host server system. Time sensitive data from the warehouse passes to the company systems managed by technical team who provide the 24/7 monitoring service across the whole fleet and to management who have a screen based system to display real time alerts, performance data and other management information. The system includes the fleet intranet; phone, messaging, internet, video conferencing, applications and whatever the technology offers. These allow the staff on the ships and in the offices to communicate with each other as a single business unit. The technical team might be responsible for real time support of fleet staff; preparing all regulatory reports; planning fleet operations; and developing and operating routines for more efficient running of the fleet. These systems are already in use by other transport providers, for example, UPS (see proposition 4 below). The benefits of automation often fall outside the normal accounting framework, but are nevertheless important. 2. Fewer accidents and unplanned breakdowns lead to seamless operating performance & less disputes. 3. Better use of assets because management are taking well informed fleet decisions. 5. “One company” culture, group wide communications, teamwork and better career progression. At the heart of the Smart-Shipping strategy is the use of productivity systems which have been very effective in the manufacturing industry, but was never possible in shipping because the ships were managed as autonomous production units. Peter Drucker, in an article about the automation of small manufacturing businesses, thought that QA improvements from automation almost always have much greater benefits than management anticipated. “Automation, wherever installed in a manufacturing plant, has paid for itself in three years, often much faster. Automation builds quality standards and quality control into every step of the process. Quality savings alone are likely to repay the cost of automation”. He thought cost savings of up to 30% might be achieved if this whole system can be made to work. ICT technology potentially offers the opportunity to treat a fleet of ships as a production unit, reaping these benefits. These are the mechanics, and the ultimate aim is a fleet system managed in the way that, for example, BMW runs a car plant. It represents a major culture change compared with today’s business. The ships are no longer managed as individual units. With so much information available management can take planning to a level not previously possible. Global communications and the cloud are a real revolution, equivalent to the submarine cables in the 19th century, making it possible for the first time to manage and optimizing the operation of the fleet as a whole. Many companies are already doing some of these things, but tying them together into a system which extracts the maximum value is likely to be difficult and take time. In the past it was not possible to even make a start because the communications technology was not viable. Today this is no longer the case. But the focus on a spot market driven system for arranging freight transport and the lack of involvement of cargo interests in the strategic development of the industry will present an obstacle. It took decades to develop containerization systems and arguably this is more difficult. But some very big improvements in the performance of the business are possible. What will this new business look like? Well, other businesses with better communication access are already moving ahead, as the following three examples suggest. Boeing has developed its Aircraft Health Monitoring (AHM) system which uses an on board server on each plane to monitor every aspect of the plane’s operation and performance. This information is processed on the server and in an appropriate manner transferred to central databases operated by the aircraft company. This data allows the immediate monitoring of component performance. It also allows navigation to be tracked and automated where viable, with key risk situations being treated differently from routine transportation for example long voyages across the Pacific. Rolls Royce monitor their aircraft engines real time, with a team in Derby dedicated to this task. UPS have 48,000 vans with telemetric monitoring devices. They use a plug in unit on each van and a telemetry program to gather data and advanced analytics to identify relationships in the data. The telematics devices capture data on more than 200 elements, including speed, RPM, oil pressure, seat belt use, number of times the truck is placed in reverse and idling time. This allows UPS to determine a truck’s performance and condition, as well as identify ways drivers can make small adjustments that yield major results. As far as navigation is concerned, the Google car is an interesting example. It shows what is possible and what is not. Morgan Stanley studied the potential benefits and estimated $1.3trn, of which 38% was fewer accidents; 12% better fuel consumption; 11% congestion and 39% productivity improvement. There are eight areas of the ship where varying degrees of automation should be possible. These include machinery management; navigation and route planning; alarm management; maneuvering; power management; ballast management; trim management; and cargo management. The objective here is to build in increased levels of automation to do routine tasks which are better done by machines and people. Moving to shipping and maritime economics, this could turn out to be a tremendously exciting era for Maritime analysts. Operating a fleet with servers on every ship; gathering information about every aspect of operation; categorizing it; sending it to a central database; and turning it into meaningful management information will involve “analytical systems that can figure out what the various data means”. Shipping revolutions don’t happen often and they take a long time. Global navigation lasted 300 years. Steam shipping revolution 150 years. Global free trade has lasted 65 years so far. They happen when technology shifts coincide with changing needs of sea transport users. For example the need for new sources of spices; the need to service the empires; the need for cheap raw materials and transport costs for exports. It’s a two way process. Change is difficult for companies with fleets built for a different model. Change creates opportunities for new entrants. Bulk shipping in the 1950s and 1960s produced new independent owners. Maersk, the biggest container operator today, did not get serious about containerization until the mid-1970s. Maritime economics has many mathematical economists who might offer a valuable resource in using this data by developing apps and systems to do specific jobs. The fleet of the future will need algorithms and apps to operate the systems for everything from automatic/assisted navigation to condition based monitoring of components. The safety of the crew, the health of the crew, the safe operation of the ship, the pilotage algorithms (maybe?? ), cargo handling, engine tuning. Every single aspect involves a small economic model and suddenly the world of the maritime economist is much bigger, more interesting and potentially more productive than it was. In today’s maritime transport system investors are frustrated; cargo shippers and regulators are not really impressed with what’s happening; and technologists are struggling to find hardware solutions. They are frustrated because today’s business model locks them out from the biggest technical revolution since bulk shipping in the 1950s. Until the 1980s the shipping industry was achieving remarkable results, but then improvements slowed because costs increased (e.g. oil) and technicians could offer few improvements to ship and engine designs. If major improvements do not come from cheap fuel or more efficient ships, the industry must look to better management of transport productivity, through better use of assets and logistics. This paper has argued that a new generation of Information and Communications Technology (ICT) mean that for the first time these objectives are possible. The Smart-Shipping toolbox includes satellite communications; ICT; telematics; automation; personnel management; et cetera. Will it happen? For good reasons, today’s shipping business has limited technical depth, especially in the ICT area, and its customers have little incentive in paying a cent more than they have to for a better service. Shipowners with slim staffing levels, confronted by shippers who “won’t pay for quality” are trapped. It’s instant payback or nothing. But the Fourth Wave business model is not an “off-the-peg” solution. Management and organization take time and resources. Change is not inevitable, but when there’s a real gap and the technology to fill it, eventually someone will step in to do the job. The new generation of maritime professionals is much closer to this than the older generation. They have time on their side and they have the skills. Maritime Policy and Management, the economic journal, is packed with mathematical analysis of optimization problems. In a Fourth Wave shipping company I can well imagine a team of these bright maritime analysts developing sophisticated numerical tools and iPhone style apps which improve every aspect of the company’s maritime transport operation. It’s cheap compared with the $90m cost of a VLCC. What an exciting future lies ahead. But in shipping changes happens slowly. As Peter Drucker said, the best way to predict the future is to create it – but that will be a long and winding road. As usual Dr Stopford has produced a thought provoking article that warrants our attention. You may not think a ship can be run like a car plant and ships will never be able to deliver “just in time” but this article highlights the benefits that might be gained from such thinking. In summary: aren’t computers clever! I bet they could even help ships. Although I don’t know how. However, with so the many marine software providers in the market and in-house legacy technologies already installed on many vessels, the existing state of technology in the shipping industry is fragmented and will no doubt interfere with the introduction of end-to end integrated solutions, already in the market that have been developed within other industries and have been adapted for shipping/maritime e.g. Ericsson’s ICP Cloud platform. GE is another example, where an industrial group has developed into a US$6 billion software company offering the Predix cloud service for industrial data and smart analytics leading to what GE calls “asset performance management and asset optimisation solutions”, all of which might overcome the inefficiency that Martin Stopford refers to.